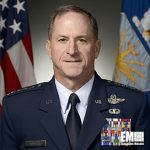 Gen. David Goldfein, Air Force chief of staff, said the service branch may purchase a new variant of the F-15 aircraft if budget requirements are met, Defense News reported Saturday. He told the news outlet that the potential variant, dubbed F-15X, will not use funds allotted for the F-35 program. The defense budget for fiscal year 2020, while still not finalized, has been proposed for $750M. The Boeing-made F-15X would feature a new airframe and boosted capacities for radar, electronic warfare and missile count, the report noted.